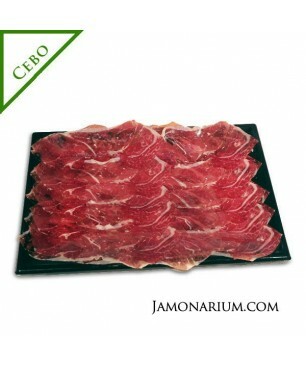 The sliced Iberian Bellota Spanish ham is presented in thin slices and vacuum-packed in 100gr sachets. This is the easiest way to eat a delicious ham. It can be stored up to 6 months in the fridge or in a cool place. Intense flavour and an incredible aroma. Sold in a 100gr sachet. Ingredients Iberian pork ham, salt, sugar, acidity regulator (E-331iii) and preservatives (E-250, E-252). Nicolas L. el día 08/29/2017 La réputation du Jambon Ibérique de Bellota n'est plus à faire, et celui que propose la boutique est toujours d'exception. Sebastian N. el día 08/24/2017 Sehr Guter Schinken. Es empfiehlt sich die Scheiben etwas an der Luft zu lassen vor dem Verkosten, wie beim Wein muss der Schinken noch etwas atmen wenn er aus der Packung kommt. Grégory P. el día 01/14/2014 Très bons. Coupés très finement, beaucoup de goût !Oui je recommanderai. Le service est rapide, l'emballage parfait et les mets excellents. Rafael M. el día 01/10/2014 TRES BON & TRES RAPIDETRES BIEN  OUI JACHETERAI A NOUVEAU ET JE CONSEILLERAI AUTOUR DE MOIENCORE MERCI. Mateo T. el día 06/16/2016 The product are amazing good. 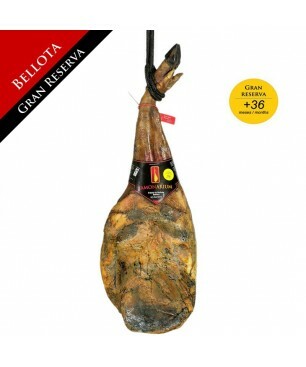 The best is of course Jamon Iberico Bellota.My opinion is that you are really professional , from shipping side to the products side.Very simple to buy it via Web , and delivery time,tracking etc is as described on your web.Definitely i will recommend you to my friends. Diego A. el día 01/27/2016 Los diferentes jamones, han sido tan buenos que ya no hay nada...le hemos comido todos con delicia! Los turrones estaban especialmente deliciosos (tanto los de aceito como los otros). Jacqueline S. el día 01/27/2016 je suis contente des produits que j'ai achetés dernièrement . Nous avons beaucoup aimé le jambon Bellota qui est excellent . Guido Mario S. el día 12/11/2013 I am really satisfied. I've bought some packages of sliced Bellota Pata Negra Spanish Ham and these are my observations:- The customer service was really excellent. I had all the updates of the status of my package sent to my mail, which, I think, it's trademark of a top-notch quality customer support.- The delivery was extremely fast and efficient (ordered on Friday night, I've received it today...and, as you know, couriers don't allow sending packages during weekend...so the timing was perfect) and the packaging was made with great care.- The ham is the best Jamon Iberico I've ever tasted in my life. The flavour is really intense and the taste is sublime. Moreover, this is the first time in my life that I find a vacuum-packed product which *truly* has the same flavour and aroma as if was just cut! It's amazing! I truly endorse this product...saying that it is *excellent* is an understatement, really! carmen m. el día 12/09/2013 Fantastic absolutely superb, great service. Regards, Terry. Valerie Q. el día 11/18/2013 Very rich flavor and delicious waxy texture. Perfectly packaged. Excellent and efficient customer service and super quick delivery. It really made ordering the ham very easy and took the guesswork out of it. Would certainly recommend Jamonarium and will order again when I am next in Europe. I bought quite a bit of ham but am finishing it very quickly! 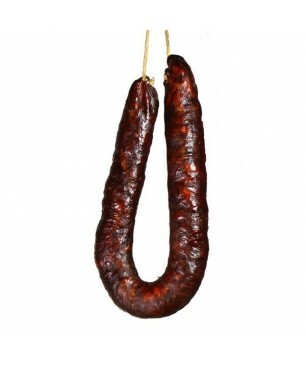 Philippe H. el día 12/07/2015 Vos produits sont très bon et notamment les chorizos et jambon en tranche (36 mois). Franco C. el día 06/13/2013 Davvero incredibile!!!! !un sapore unico...confezionato in modo eccellente per mantenere la qualità e consegna velocissima!! !